Mama K and Dad came to visit last week. I hadn’t seen them for many months and was very, very happy. I am excited to tell you that I have now written down all of Mama K’s recipes for the most traditional yet exciting Greek foods! And a more adventurous one for pork chops with pineapple and cassius nuts, which as you have rightly guessed is from my adventurous dad. 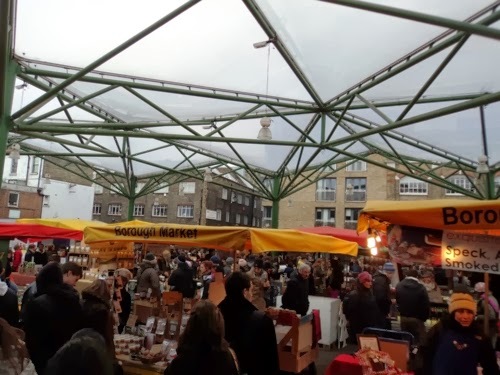 This week Nafsika compares London’s Borough Market with a food market in Greece, where she originally comes from. It’s a cold Saturday morning in London. The air is crisp and you can feel the snow coming. You leave your warm, comfortable couch, scarf and gloves in hand and rush into the tube. You get confused by which exit to take, London Bridge station tends to be very chaotic. After walking for a while because yes, you did take the wrong exit, the smell of food reaches your nostrils. You know that you have reached your destination. Borough Market appears in front of you, colourful, vibrant, inviting. You tie the scarf around your neck and start wandering amongst the stalls and tents, forgetting about the cold and taking in everything London has to offer. Farmers’ markets represent our food culture, who we are, what we eat and why. 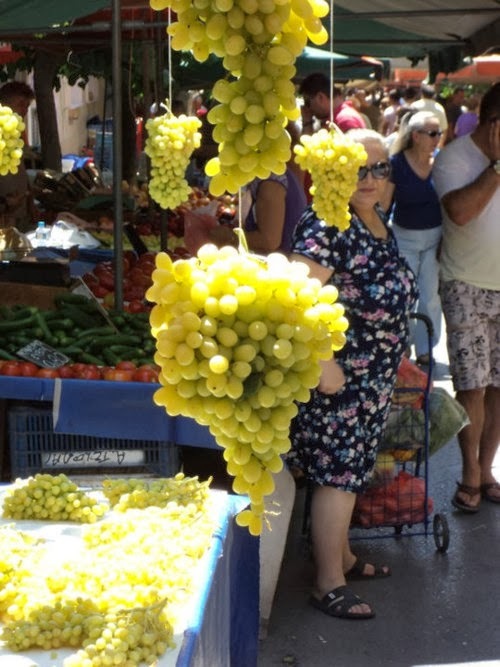 Join us as we explore London’s farmers’ markets, while thinking of the ones in sunny Athens, Greece. They usually take place in the mornings. So unless you are prepared to skip work to stroll around cartons of fruits and vegetables, you have to find one that is open on a Saturday. Here in London everything is so organized that a simple internet search will easily point you in the right direction. And many or maybe most farmers’ markets seem to be open on Saturdays - smart! The setting is usually the same: along the two sides of a street, or in larger spaces lay bright stands with magnificent local produce of excellent quality and behind them, farmers, fishermen, growers and bakers await for their next customer. 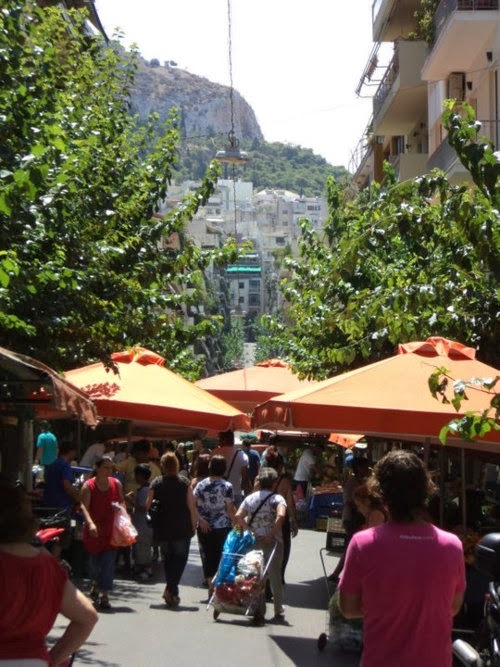 In Greece, the setting is similar and every neighbourhood has its own little market. 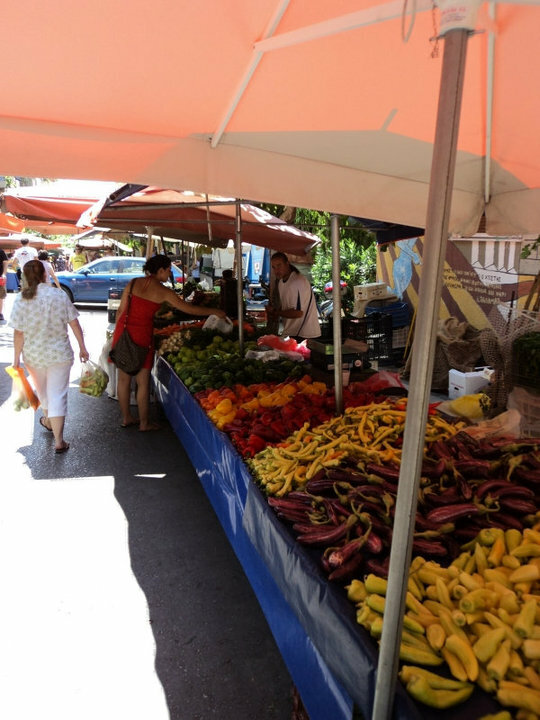 Farmers’ markets (or “laiki” as we call them) tend to be quite loud, vibrant, full of energy and compared to London, slightly more traditional, in the sense that there is not such a wide range of products. Sellers yell, loudly advertising the truly excellent quality of their products, greeting you and passing you a bag while bargaining prices, collecting money and giving change to the older woman standing next to you, talking at the same time to their fellow sellers. Getting past the apparent roughness you can get into long discussions about baby eggplants (are they a new variety or are they just eggplants that have been picked early?) and you will usually leave the stand with a few recipes from other shoppers as every Greek cook has their own version of oven baked eggplants with tomato and parsley. You see, If not for anything else, the farmers’ market is the perfect place to exchange recipes and cooking tips! 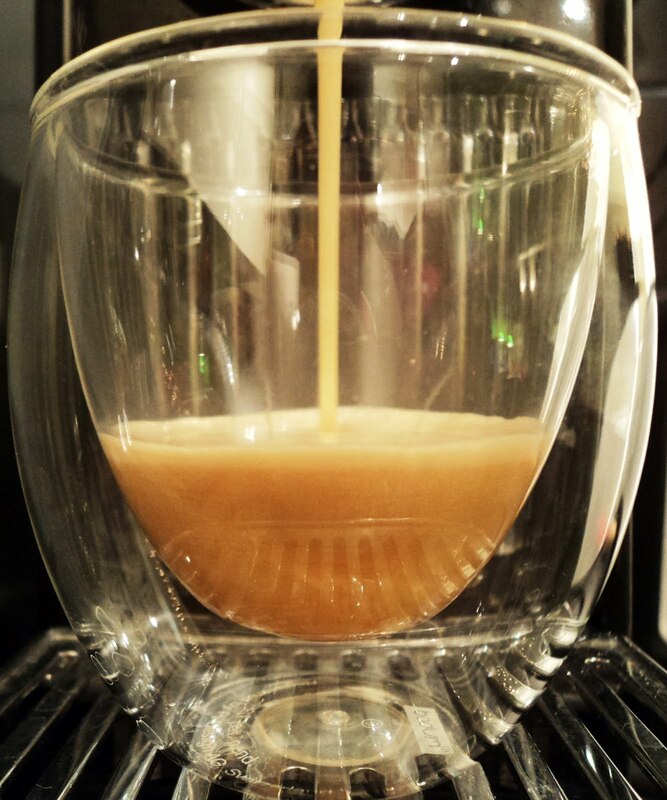 Despite the lack of variety, the quality is extraordinary and a huge advantage is the low prices. 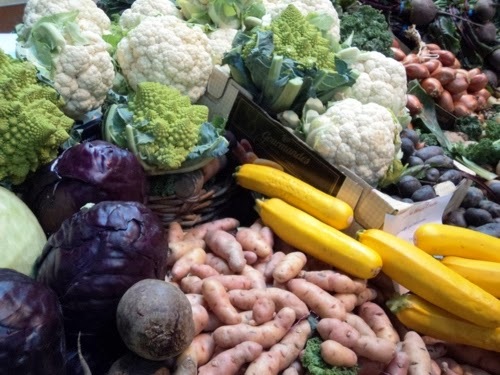 On average, farmers’ markets are cheaper than supermarkets which isn’t really the case here in London. Farmers’ markets are more exquisite, more posh. But why? As we think about that, we walk around, passed the cheeses that taste like heaven, charcuterie, truffle honey, yellow and green tomatoes, stripped beetroot, white eggplants, white and purple-orange carrots, we become fascinated by the abundance and variety of fine foodstuffs. 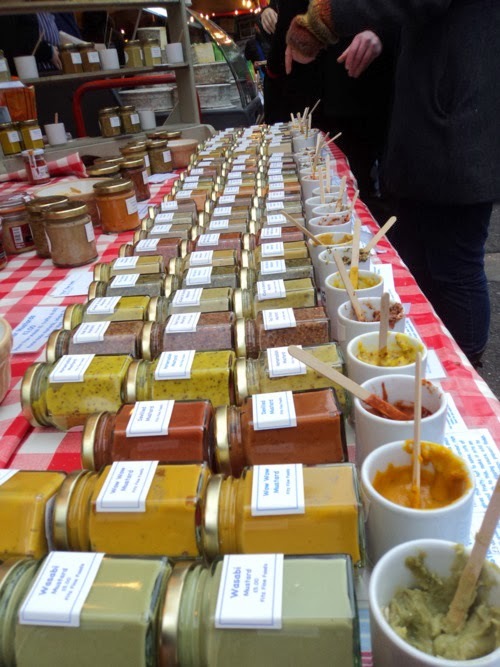 The sellers at London’s farmers’ markets are polite, many of them with very unique products, local and very exciting. Cheerfully, they offer details on their goods, where they are coming from, what methods of production they use. No recipes but very useful information! Furthermore, although in Greece it is an unwritten rule to buy large quantities of foodstuffs, so much so that you end up with enough tomatoes to make a summer salad, tart, sauce and even a wonderful tomato terrine with one trip to the “laiki”, here you can buy only one yellow courgette if you want to. Even if it sometimes costs more than a bag of courgettes from the nearest supermarket, it’s worth it for it is..well…a naturally yellow, sweet and juicy courgette! And the food on offer! One can have a proper banquet with the delicious “street food” you can find in London’s farmers’ markets. Duck sandwich? Melted raclette cheese with potatoes and gherkins? Oysters? Fresh juicy slices of watermelon? Flavours that please all senses, especially if you’re interested in exploring new things like us! Listening to the sellers’ voices, looking at nature’s magnificent coloured citrus fruits in winter , touching the green spiky romanesco broccoli, smelling the sizzling sausages and tasting ripe cherries in the summer, every trip to your local farmer’s market can turn into a journey of discovery, a treasure hunt that piques all senses. Isn’t that what real food is all about? You also face the risk of returning home with a bunch of samphire, just because it looked interesting and although you have no idea what to do with it, you remain optimistic. I wonder if we could maybe replace the supermarket, treating ourselves once a week with fresher, brighter, tastier ingredients. Start by taking a walk to your local farmers’ market next weekend. Even if you return home with just one yellow courgette, it is guaranteed to transform even the simplest soup into a delicious dinner. Oh, and if you have any ideas on how to cook samphire, please let us know! I will be back with some more cooking soon! 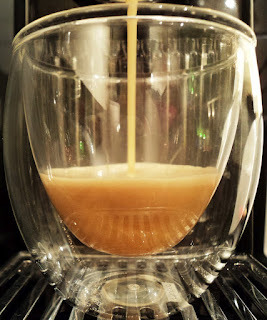 For now, join me as I prepare a cup of hazelnut latter and biscuits, writing this week’s column.